Hi! It’s time for J.Crew new arrivals again and this time I’m bringing you photos from the dressing room at one of the J.Crew locations in Manhattan. The May 2016 catalog items were released earlier this week and my first chance to check them out in store were at the tail end of my trip to New York City this week. I had grand plans to hit up a few J.Crews in the city, but most of my shopping time was spent in the stores I don’t get to visit in person at home (sorry, J.Crew!) But, there was a Crew a few blocks from where I was staying, so off I went as a last stop this morning before I had to get to the airport. I did order a few items online earlier this week, including the No. 2 Pencil Skirt in Paisley (yay for a printed cotton pencil skirt!) and the Cotton off-the-shoulder top in Stripe. I apologize in advance for the Working Girl vibe in most of these photos as my white Converse Chuck Taylor IIs were my walking around and shopping shoe of choice these past few days (even if they are a little bit dirtier now). First up, the Short-Sleeve Cotton Shirtdress in white. This also comes in black and coral and also tall and petite sizes. These types of dresses are always hit or miss for me but it seemed like a great summer dress if it worked. This is a size large. Size wise, this is good and I wouldn’t mind the few extra inches the tall would give me. But look at those wrinkles. Sheesh. That’s just from taking it off the hanger and trying it on. I’m feeling very Tom Cruise in Risky Business in the white version of this or feel like I should be in a nurse’s Halloween costume. Maybe the sneakers are throwing me off. Styled right, some people could pull this off. I’d consider this in black though and I appreciate that it’s cut a little more generous through the hips and isn’t indecently short in the regular size. Aside from being a wrinkle magnet, it’s also a bit sheer in the white. My summer is pretty short in the northeast so I have to decide if this would get enough rotation but I’m definitely thinking about it in the black. Next up, the Silk Smocked-Waist Dress in Paisley. This is a size 12. These types of dresses are either flattering or a total disaster with the smocking. I would have liked a little less smocking in the middle and a few extra inches on the hem. I have a black dress from Banana Republic from a few years ago with a similar style (less smocking, longer hem) and I wear it all the time. This dress sadly doesn’t come in tall so it’s a pass for me. I am also surprised as I looked up the style number that it’s silk – the material was incredibly lightweight and not memorable as being silk. Some people will look really cute in this dress and I’m surprised that I liked it more than I thought I would even if it’s not totally for me. Next up, the Short-Sleeve Dress in Multi-Tweed. This is a size 12. Yeah I know, I look like I’m off to take a power walk over lunch. I liked this dress a lot and it’s a pretty mix of pastel blue, yellow and purple. With a pair of pastel heels, it’s a beautiful spring/summer work outfit. However, it is a wool and acrylic blend and it was on the warm side. The colors are obviously warm weather colors but the material reads like a cooler weather dress. For an air conditioned office, this could be perfect, but if you’re planning on a summer shower in a warmer climate, I’d skip this. 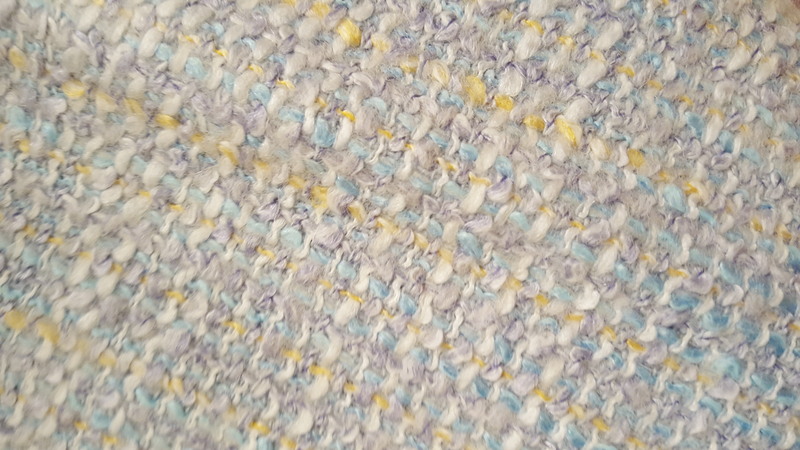 Here’s a closeup of the material. And the last dress, which I’m happy to say is en route to me, is the Diamond Jacquard with pique a-line dress in navy. This also comes in white. 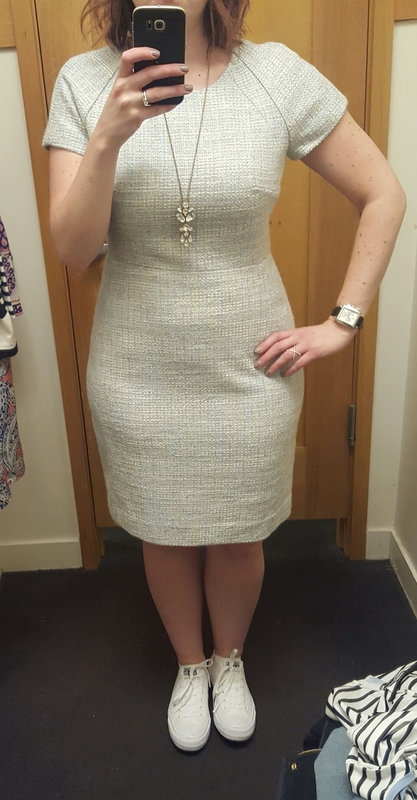 I never purchased last year’s a-line jacquard dress and while this is similar to a shift that I already own, the dress was close to sold out online which pushed me to try it out. This is a size 12. Well, I’m glad and disappointed to know that my J.Crew store isn’t the only one who has trouble keeping their mirrors clean. And I was there first thing in the morning – J.Crew, find your windex!! Aside from the dirty mirror, this dress was a perfect fit. The jacquard material wraps around the side and back of the dress and the a-line is exactly what it should be – a-line! J.Crew bills a lot of their dresses as a-line that usually end up straight on me so I was glad that my hips had some room to breathe in this one. 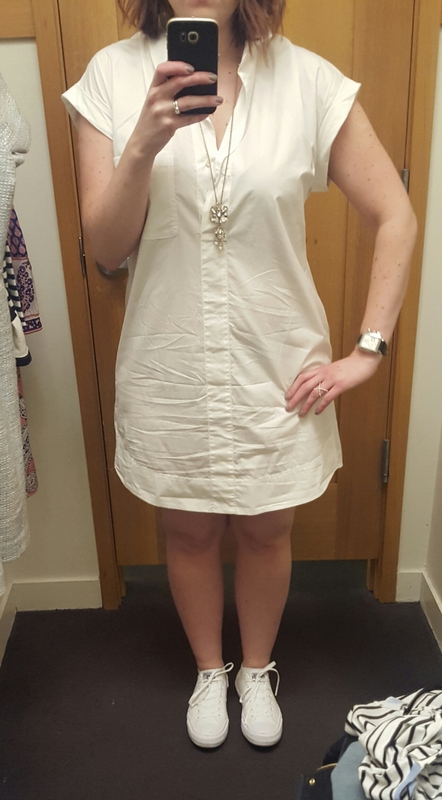 Do I need another navy dress? Well, no…but the fit on this was pretty spot on. And the length was right at the knee in the regular length. Here’s a look at the jacquard pattern around the side of the dress. Next up, the Mixed Paisley Top. This was originally sold out in almost all sizes online when the collection rolled out earlier this week, but the sizes seem to be back in stock online. This is a size 12. 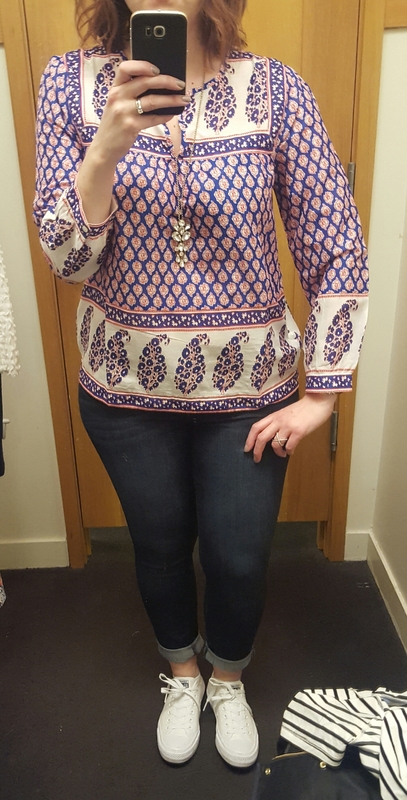 I liked this blouse when I saw it on others online, but the fit is funny in the arms on this one, so it was a pass. I like the look and idea of the top but the seams in the arms/shoulders rubbed and were tight, and going up a size would have just made it fit funny. I’m all for a nicely printed cotton top for summer and this might work for some with smaller shoulders. Lastly, the Patchwork-Striped T-shirt in a large. I’m wearing it with the Midi Skirt in Cotton Clip-Dot (size 10) but it looked so ridiculous with my sneakers, it didn’t photograph well. The cotton on this is substantial and I’d say it’s TTS to a big. I might have tried a medium in this for a more fitted look. If you’re stripesick, this could be another one for the collection. I found it to be a bit busy, like, why mess with a good thing? 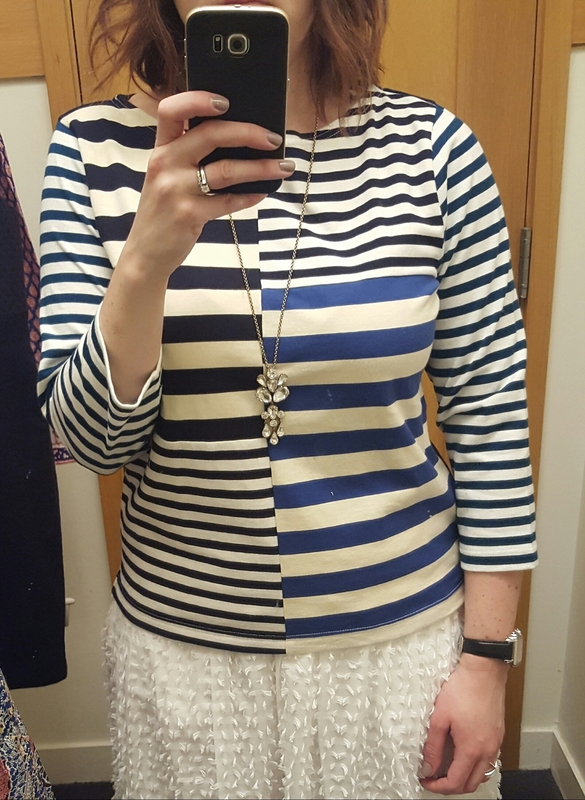 Speaking of stripes, I also tried the Teddie pant in seersucker and they ran really small – I could barely get the size 12s on, let alone zipped. I liked the seersucker fabric on these, but size up if you’re trying them. So, there are some of the new May 2016 new arrivals. Have you tried any of these? Any favorites or not so much? Would love to hear what you think and thanks for visiting!